Whitney is an up-and-coming Stylist, and Make-up artist, with 2 years of experience! She has a keen eye for detail and will always make sure you are getting the the best service! She is Professional, clean, and up to date with all of the latest hair trends. She is eager to learn and expand in the industry, and does so by continuing her education. She creates beautiful Make-up looks for special occasions, weddings, Proms, as well as special effects make-up. 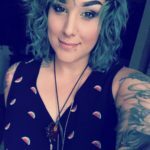 Whitney Specializes in multiple haircutting techniques, L’anza Healing Color, Balayage, Fantasy Colors, and is in the process of getting Certified in Brazilian Blowouts, and Micro-blading. To schedule an appointment, please call or text her at (520) 749-5522.